As I wrote in the previous post, on the afternoon of 1st May hubby and I visited Nishi Honganji Temple in Kyoto. 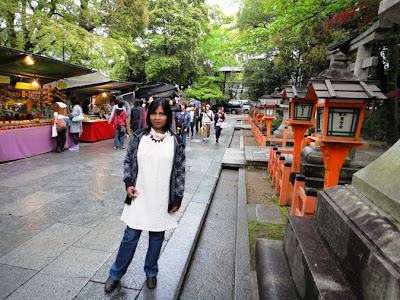 Next, we visited Yasaka Jinja Shrine about which I will write in this post. Yasaka Jinja is a Shinto shrine located in Gion district of Kyoto. It is situated at the eastern end of a street named Shijo-dori, just off Higashioji-dori. It is a popular tourist destination and borders a famous park named Maruyama. 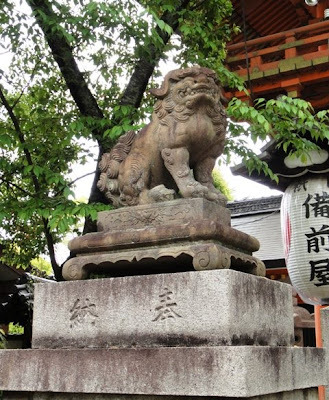 Deities of Susanoo-no-mikoto, his consort Kushiinadahime-no-mikoto, and eight offspring yahashira-no-mikogami are enshrined at this shrine. 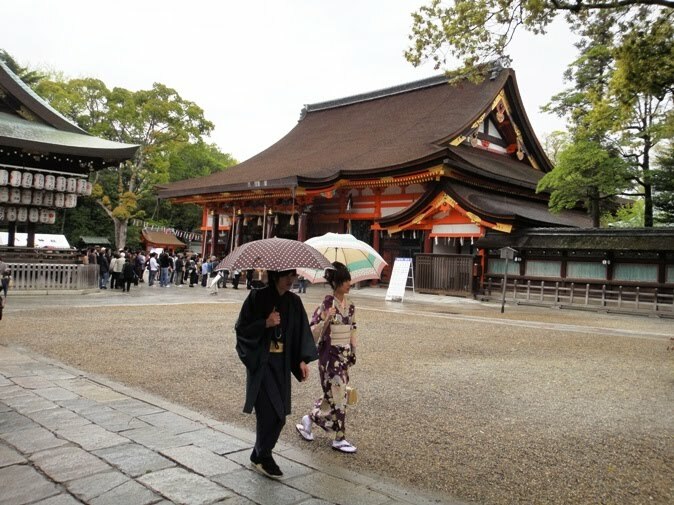 According to the legend of the shrine, it was first constructed in 656. 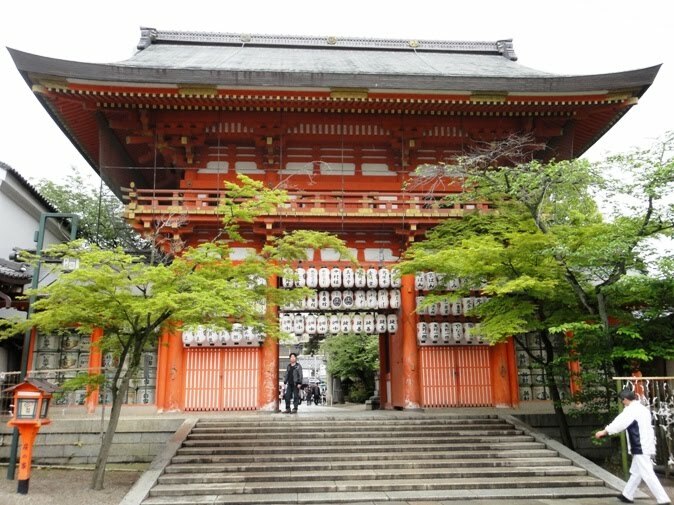 The shrine became the object of Imperial patronage during Heian period. 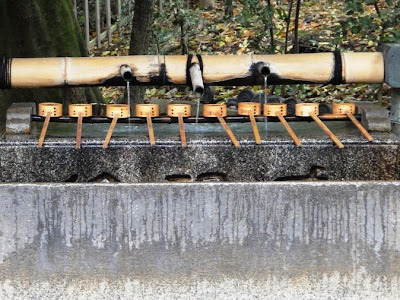 In 869, omikoshi portable shrines of the main shrine were paraded through the streets of Kyoto to ward off an epidemic of plague that had hit the city. 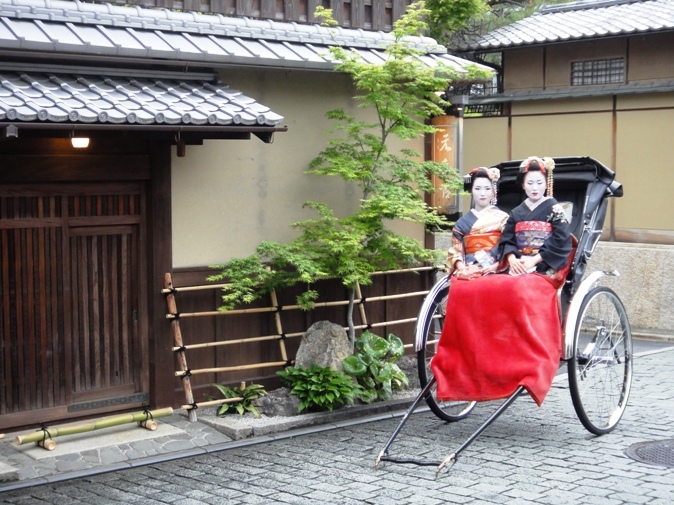 This was the beginning of Gion Matsuri, an annual festival which is now one of the largest festivals of Japan. In 994, Emperor Ichijo listed this shrine as one of the shrines where Imperial messengers reported important events to guardian Kami. In 1654, the fourth Tokugawa shogun ordered the reconstruction of several of the buildings, most of which still stand today in the shrine precincts. The shrine was originally called Gion-sha but the name was changed to Yasaka Jinja when shrines and Buddhist temples were separated at the time of Meiji Restoration. 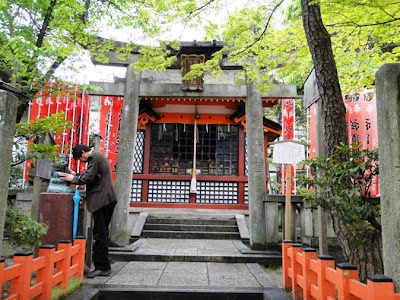 From 1871 through 1946, this shrine was listed as the most highly ranked Imperial shrines. 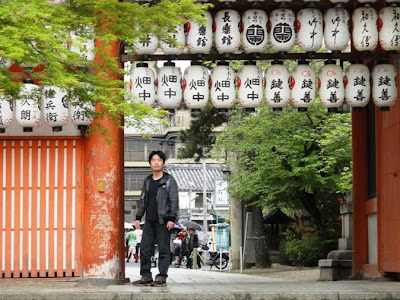 Presently about 3000 branches of Yasaka Jinja exist in various parts of Japan. 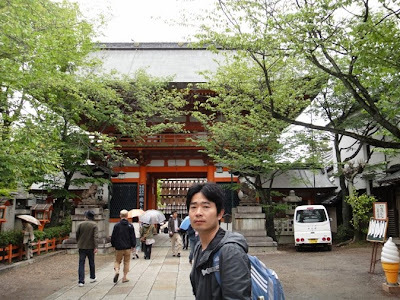 Yasaka Jinja Shrine is located about four kilometers northeast of Nishi Honganji Temple and it took us 15 minutes to reach there by taxi. After getting down from the taxi we were in front of stone steps of the shrine that led to a bright red colored gate named Sairomon. The gate is located at the western side of the shrine precincts right in front of the eastern end of Shijo-dori Street. It is a splendid two-storied lacquered gate with bright red colored posts. The original gate was burned down during Onin War, and the present one was rebuilt in 1489. The gate represents the architectural style of Muromachi period, and now is recognized as an important cultural property. In 2007, the roof tiles of the gate were refurbished and the gate was repainted with red lacquer. Usually two Nio guardian statues are found at the gates of most of the temples and shrines in Japan. However at this shrine, two wooden statues of Zuishin warrior guardians armed with a bow and arrow are located on each side of Sairomon Gate to protect the entrance and the grounds of this shrine from evil spirits. 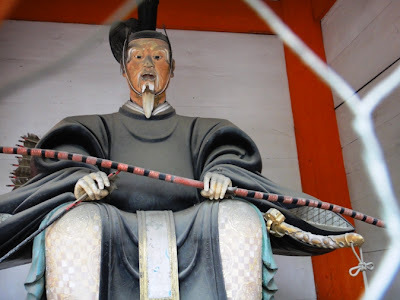 Zuishin were high-ranking court guardians to the nobles in Heian period. 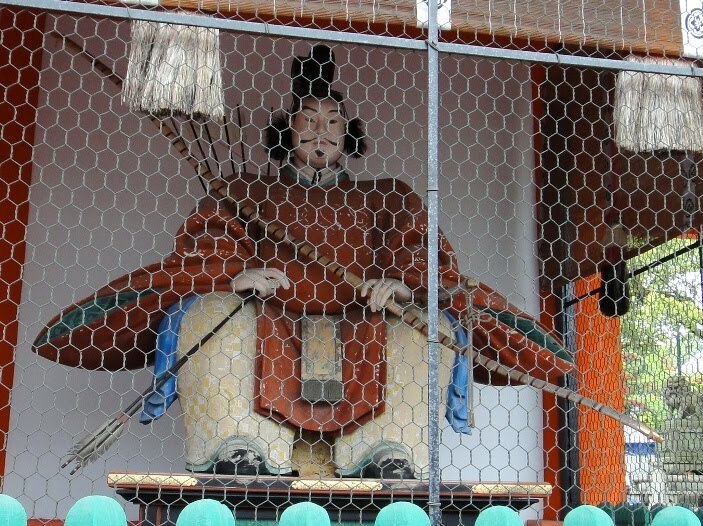 The statue on the right side of the gate is called udaijin and the one on the left side is called sadaijin. 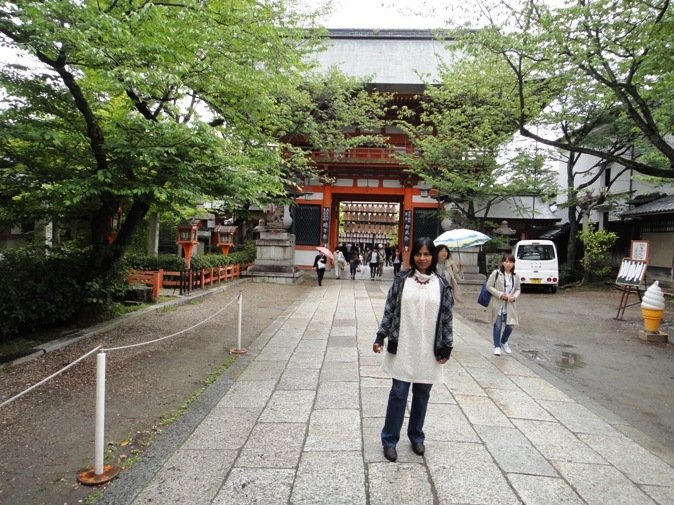 After passing through Sairomon Gate, we saw stone stairs and paved pathway that leads to the main part of the shrine. I washed my hands at a water house located to our left. Washing the hands is a symbolic act to clean the mind and body of impurity before entering the shrine. 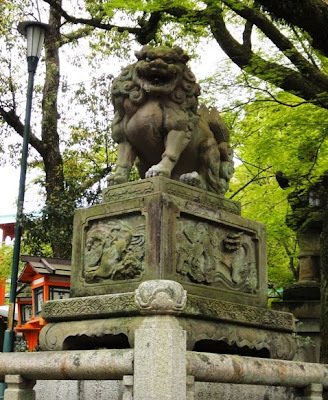 Just past the gate there is a pair of stone statues of lion-dogs Komainu that wards off evil spirits and protects the stone paved pathway and the shrine main grounds. Many beautiful wooden red colored lanterns line the pathway. In addition, there are many stalls that sell shrine related souvenirs. 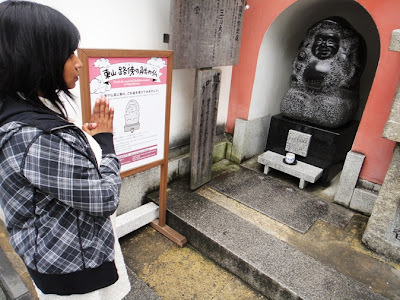 There are several small shrines located on either side of the stone pathway. 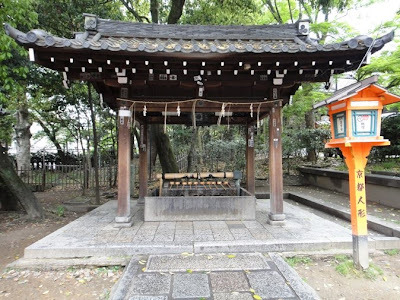 To our right, located south of the pathway, we saw a small shrine named Kitamuki Ebisu-sha. 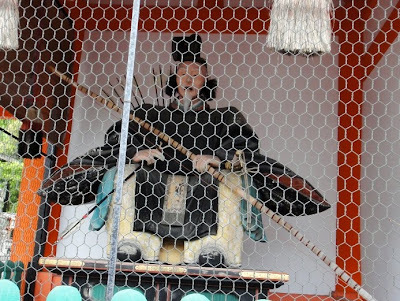 Deity of Ebisu, who is also known by the name Kotoshironushi-no-kami, is enshrined inside. Ebisu is the god of business prosperity. 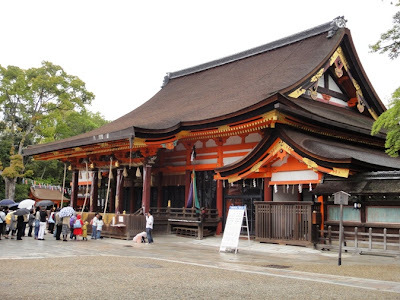 The shrine was rebuilt in 1646 and is now designated as an important cultural property. In 1998, the thatched roof was refurbished and the shrine was repainted in red lacquer. 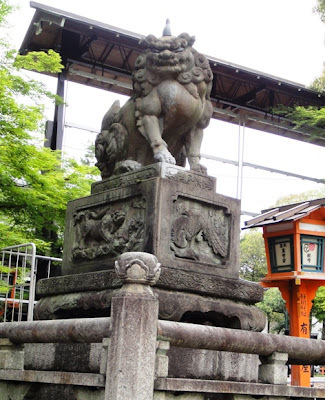 There is a cute statue of Ebisu in front of the shrine. Walking further on the pathway, we saw another small shrine named Okuninushisha located to our left on the northern side of the pathway. 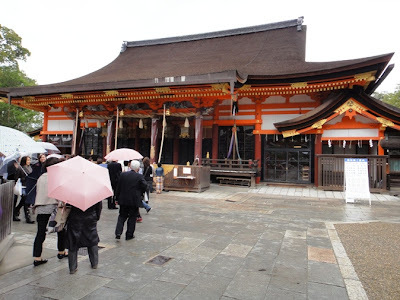 Deities of Okuninushi-no-mikoto, Kotoshironushi-no-mikoto, and Sukunahikona-no-mikoto are enshrined inside. 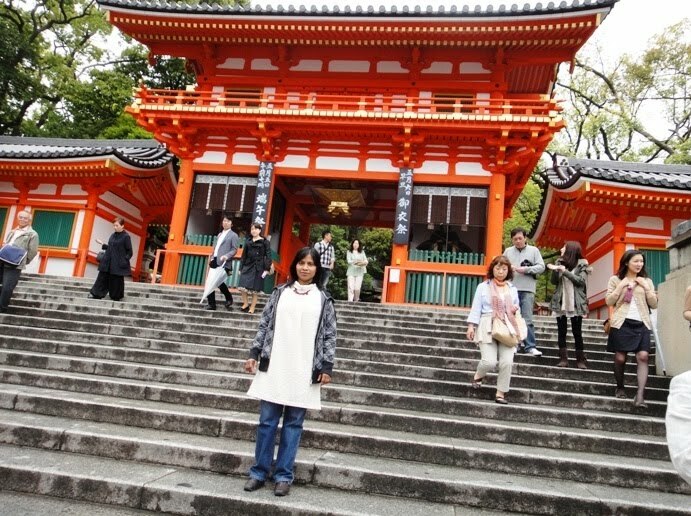 At the end of the paved pathway, we saw two huge structures in the main grounds of the shrine. 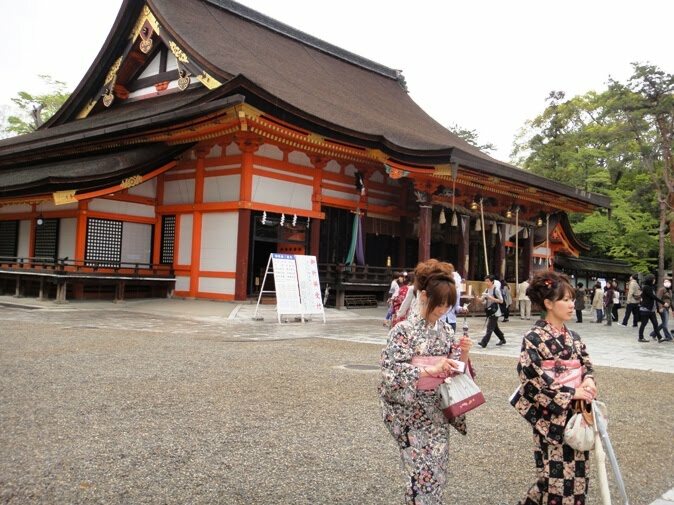 Located to our left was the main prayer hall named Honden, and to our right, opposite Honden, was the other structure named Buden Stage. We took a few photos of the shrine main grounds from various angles and positions. I reached shrine main grounds. 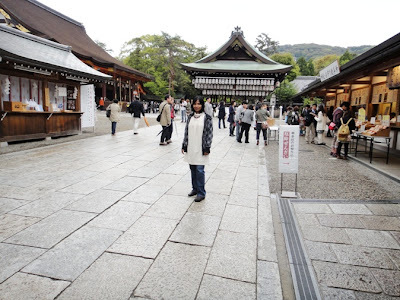 Located far left in the photo is Honden Main Hall and right behind me is Buden Stage. 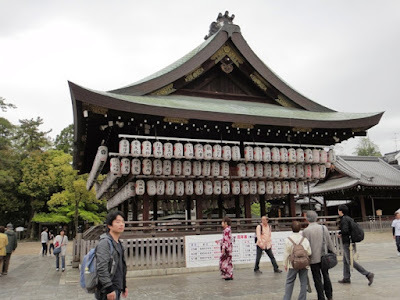 Honden Main Hall is a wooden single storied building located in the central area of the shrine main grounds. This building was rebuilt in 1654 and is now designated as an important cultural property. The building is about 15 meters high and extends over 1320 square meters. The roof of the building is made of Japanese cypress bark. The architectural style of the building is unique because the roof covers two edifices, namely, the front shrine and the main hall. 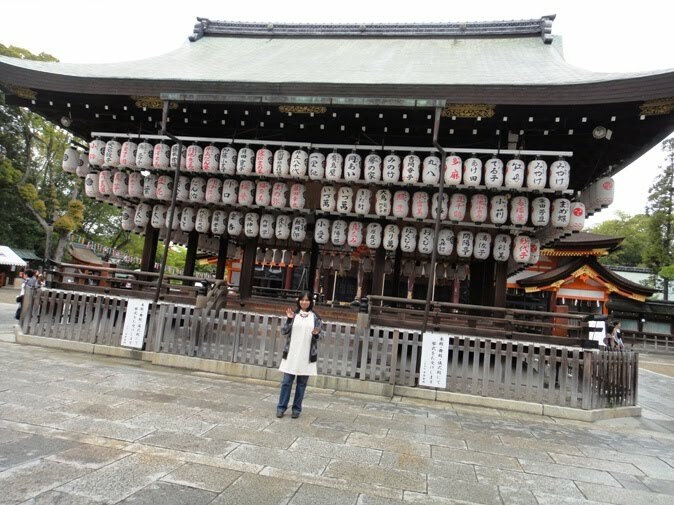 This kind of building design is rare in Japan and is named Gion-zukuri construction style after this shrine. 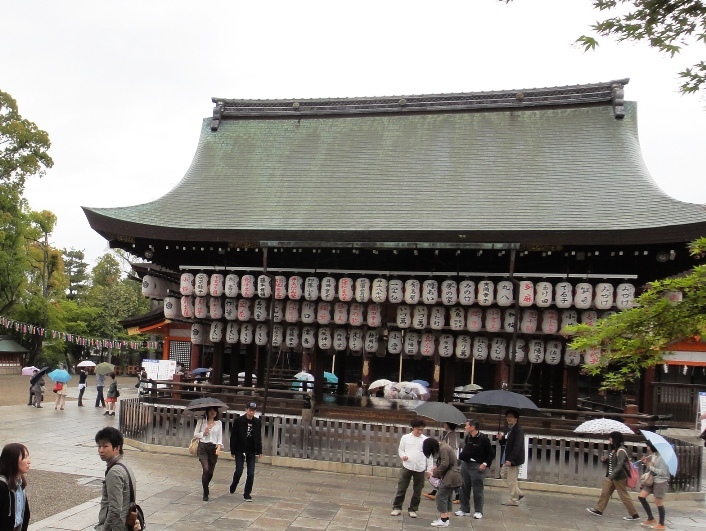 Deities of Susanoo-no-mikoto, Kushiinadahime-no-mikoto, and Yahashira-no-mikogami are enshrined inside the hall. We took several photos of Honden Hall from various angles and positions. There were many people waiting in a queue to offer their prayers to the gods, and I also stood in the queue. 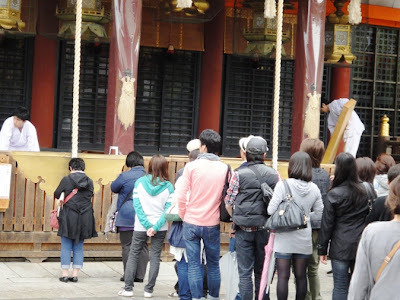 When my turn came, I made money offerings at the offertory box located in front of the building. 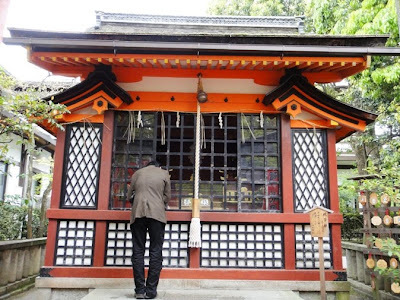 To wake up the gods, I clapped my hands and rattled the bells located at the front of the building, and then prayed for happiness and protection against evils and natural disasters. Hubby compiled a video of me offering prayers to the gods. 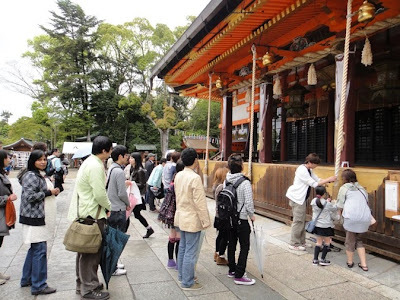 Afterwards, we moved around in the shrine precincts and enjoyed the evening atmosphere of the shrine. 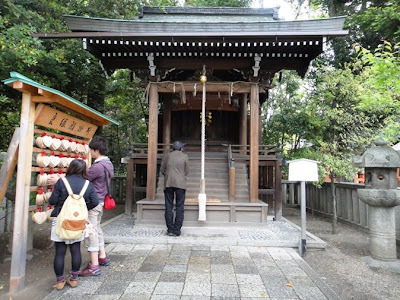 Luckily we were in the shrine grounds at a specified time of the day when the shrine staff collected and emptied the money offerings from the offertory box. 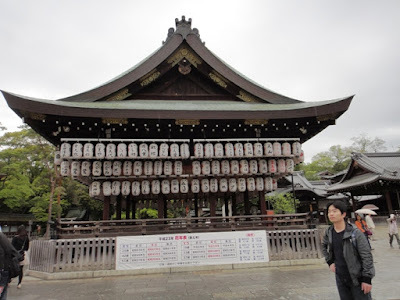 I was surprised to see the wooden structures of the offertory box so full of coins. 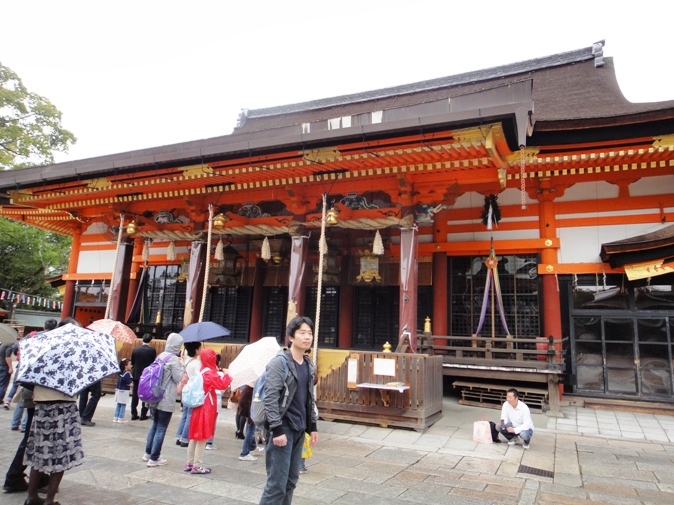 Next, we saw Buden Stage located right in front of Honden Main Hall. It is a roofed ceremonial stage for religious ceremonies. Many paper lanterns are suspended from the ceiling of the stage which makes the stage look gorgeously decorated. The lanterns bear the names of the sponsors, mostly Kyoto businesses. Incandescent light bulbs of the lanterns were replaced by eco-friendly LEDs in 2009. We took a few photos of the stage from various positions inside the shrine main grounds. 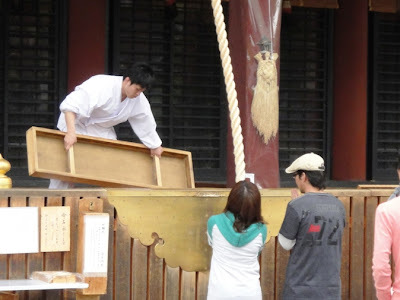 Afterwards, we left the shrine from a gate located at the southern side of the shrine precincts. 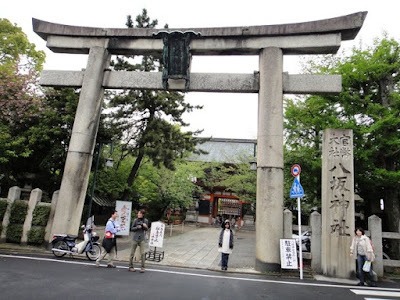 On reaching a road, we turned around and saw a stone torii gate named Ishitorii. Ishitorii is a grand structure located in front of the southern entrance to the shrine. This torii gate is 9.5 meter high and is one of the biggest stone gates in Kyoto. It was built in 1646 but was damaged by an earthquake in 1662. It was rebuilt in 1666 and is now an important cultural property. 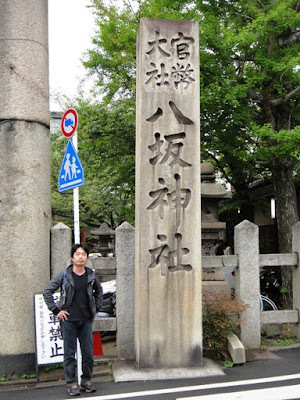 From Ishitorii Gate, we again walked back on a stone pathway that led to the gate named Minamiromon located at the southern side of the shrine precincts. 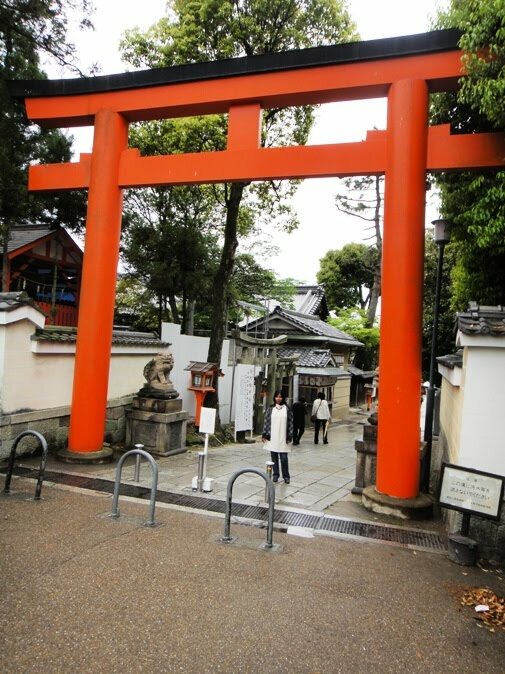 Minamiromon Gate is traditionally the main entrance gate of the shrine. It is a two-storied lacquered gate with bright red colored posts. Zuishin warrior guardians are located on each side of the gate to protect the entrance and the grounds of this shrine from evil spirits. In front of the gate there is a pair of Komainu stone statues. 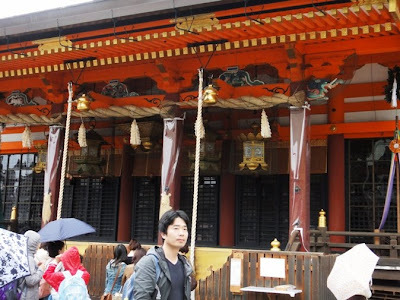 We again entered the shrine main grounds and took a few photos of the gate. Next, we left the shrine from a gate named Kitamon located at the northern side of the shrine precincts. 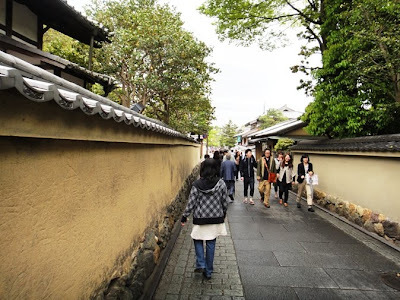 We walked on narrow streets and enjoyed the evening at Gion area. 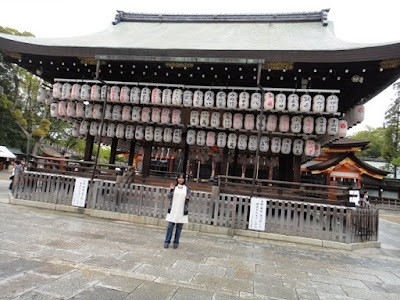 We leisurely strolled around and realized that we again returned back to the southern area of Yasaka Jinja. So hubby took out his guidebook of the area and made sure that we were not lost. 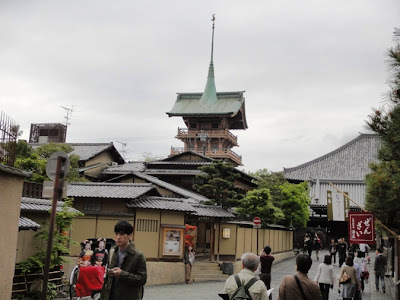 On our way, we saw a beautiful steeple named Gion-kaku Tower. It is located in the grounds of Daiunin Temple and resembles a float of Gion Matsuri. While walking, we also saw two ladies dressed as Geisha, sitting on a jinrikisha, and busy taking photos of themselves. 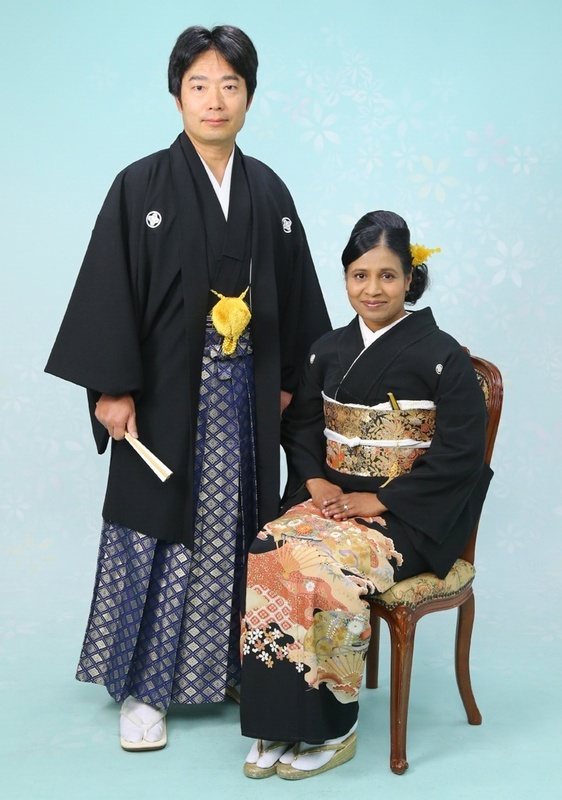 Hubby was sure that that they were not real Geishas. 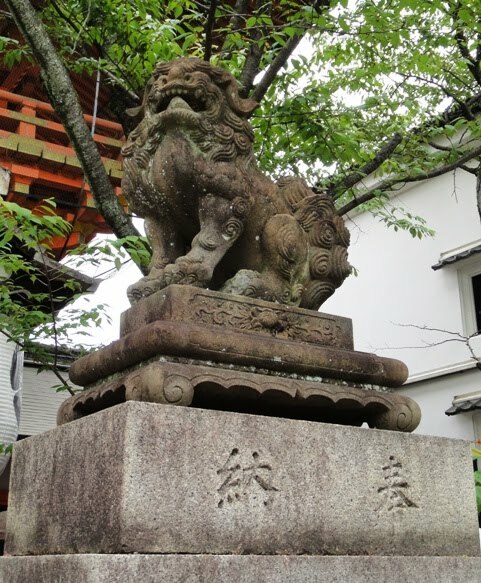 While walking on a road named Nene-no-Michi, we saw several mythology and folklore related small statues on the roadside. 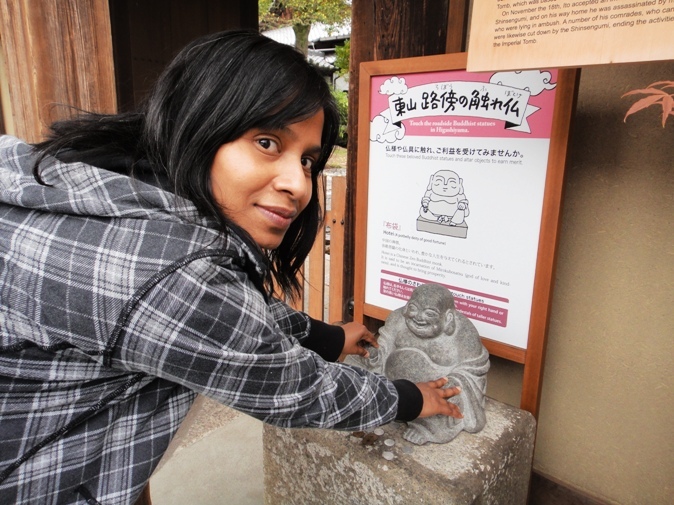 It is said that touching these statues can heal us and make us prosperous. 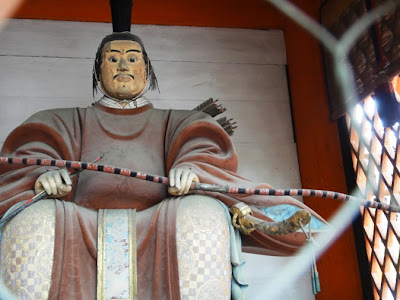 I liked a cute statue of a potbellied deity named Hotei who is one of the seven gods of good fortune, and is the god of abundance and good health. 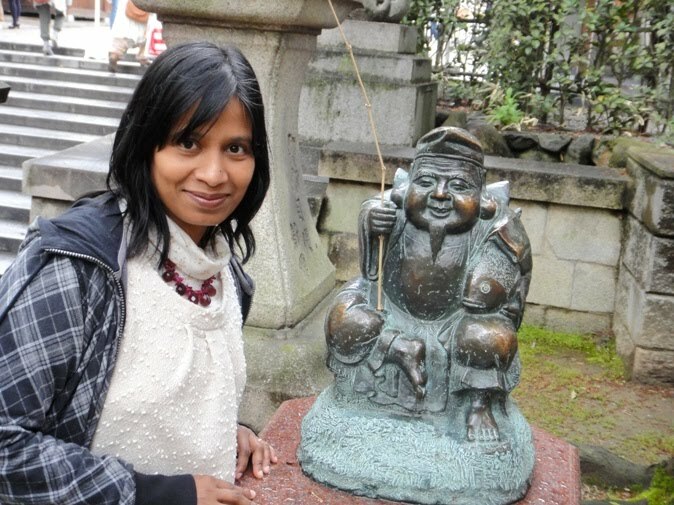 We also liked another cute statue of an Indian deity named Daikokuten who is another one of the seven gods of good fortune, and is the god of wealth and prosperity. After walking leisurely for about 30 minutes, we reached Kodaiji Temple. 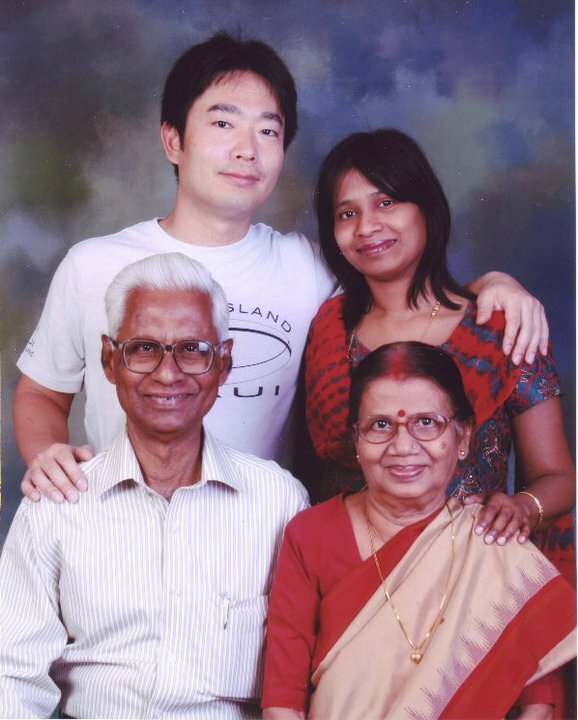 We visited this temple about which I will write in the next post. 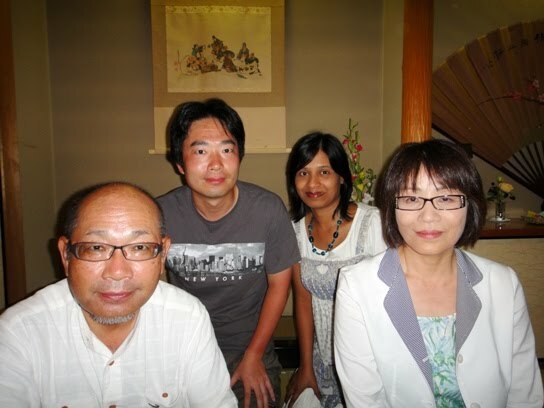 Thanks Saru for your comment. Hope you enjoyed the virtual visit to Yasaka Jinja.